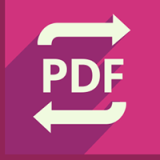 Icecream PDF Converter is a powerful handy tool that helps to convert files to and from PDF format easily. Convert PDF to DOC, DOC to PDF, EPUB to PDF, JPG to PDF, PDF to JPG, EPUB to PDF, XLS to PDF, TIFF to PDF and other formats. The program lets you work with password­protected documents (input and output), preview PDF documents, set advanced layout settings when converting to PDF. PDF to DOC conversion mechanism allows to convert PDF documents to editable DOC files keeping all the original formatting or use OCR for scanned documents. You can also merge multiple files of different formats in one PDF file. And all that goes with most thought through GUI. Hate wasting my time! It didn’t work!